Flavor Text: "Throw the damned thing overboard! It will be the death of us all!" Insane characters have 0 skill, but have no printed skill, so they are not destroyed. What about printed skill = X? A character with X printed has printed skill X that is not a number. 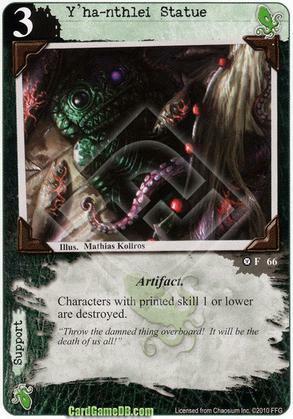 It is not 1 or lower, it is not higher than 1, printed skill for this card is uncomparable with any number. I find it a bit wierd, but for example Guardian Pillar (SftSK) and other characters created by effects do not have printed values, so X would not be alone. And X is not really a number so i guess there is nothing reasonable printed. Untill FFG rules otherwise this makes most sense for me. This seems like it would be mean with Yithian Scout. Play him, he immediately gets destroyed, allowing you to use it's response to get another copy. Then you mill them to try and come back out, where if you do, you die again, look for the third copy, and then mill them again, as you are a new copy and so get a new once per round. Repeat until you hit a character card, and wait for next turn.